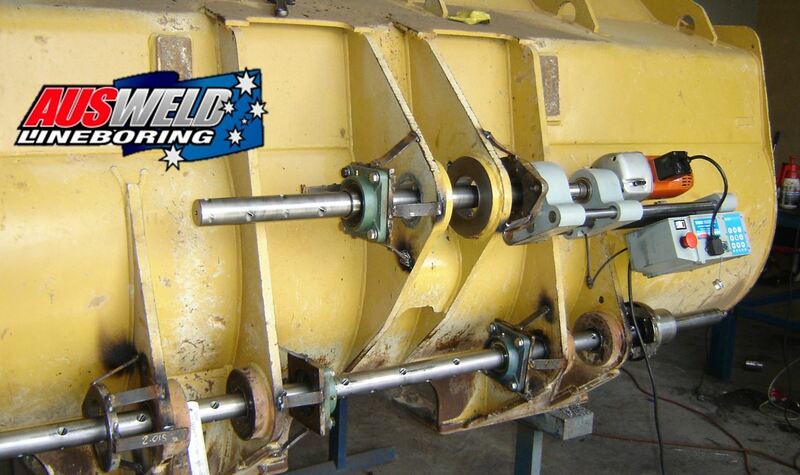 Ausweld Lineboring can minimise machinery downtime with cost effective repairs performed on site. With specialised equipment, onsite lineboring, bore welding and surface facing, restoring worn internal diameters back to original size without the necessity of excessive dismantling equipment and having expensive and costly down time. The portable lineboring machine represents an all round service tool for on-site or in-shop precision machining and inside diameter welding. Mounting the machine to the job instead of the conventional approach of mounting the job to the machine makes the portable lineboring machine simple, solid, fast, accurate and inexpensive. Some of the most common lineboring jobs include front end loader buckets, steering pins and articulation joints, excavator quick hitches buckets and boom joints, bulldozer ripper frames and blade pivots, Forwarder cranes and grapples and Single grip harvester heads. The applications for the lineboring process are endless and the machine can be adapted to suit just about every job. A fully equipped mobile service vehicle is available to provide an on-site service at the job site or at your workshop. The service vehicle is equipped with an engine driven mig, tig and arc welder plus all the latest lineboring machining and bore welding technology ready for on site maintenance. Phone 0410 067 548 to find out more.